Lilioceris lilii (Scopoli) (Coleoptera: Chrysomelidae) is a distinctive leaf beetle (see Picture) which has become a horticultural pest. As its name suggests, it feeds and breeds on ornamental lilies although other plants (Solomons Seal, Crown Fritillary and Lily of the Valley) may be colonised. 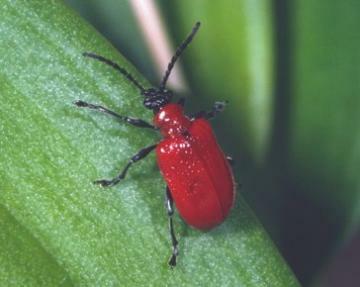 The adult, about 8 mms long, eats leaves of Lilium plants between March and June and lays its bright red eggs on the underside of the leaf. Larvae eat their way down the leaf and onto the stem. Andrew Halstead (1989) summarised the history of the species in Britain as well as giving horticultural tips. The beetle, which is widespread in Europe and North Africa was only sporadically reported in this country from the nineteenth century until 1940 when it seems to have established at Chobham, Surrey. Subsequently it spread through the whole of Surrey into Berkshire, Buckinghamshire and adjacent areas. It was present in east London (Leyton) and mid-Hertfordshire by 1995 (personal observation) and has recently been reported in Bristol (Preddy, 1999). It is now known that L. lilii has spread through Essex and much of Britain. Mike Cox (CABI Bioscience, Department of Entomology, The Natural History Museum, London SW7 5BD) is studying the spread of the species and would welcome records of its occurrence either in your garden or elsewhere in the country, or you can submit records here.